Accu Tint Inc. of Goodlettsville Tennessee, specializes in the very latest technologies that help protect your investments (vehicle, home or business) against harmful UV rays, block out heat, and save energy with professional window tinting in Nashville. We proudly offer superior quality products like Llumar®, Huper Optik®, 3M Scotchgard®, and ClearShield®. Accu Tint Inc. strives to provide our customers the very best window film products on the market today. With over 10 years experience in tinting cars, trucks, vans, SUVs, exotic cars, homes and businesses, we are Nashville's # 1 choice for window tinting and paint protection! We offer the latest styles and technologies in window tinting that protect against harmful UV rays, block out heat, and save energy in the Tennessee area. Our mission is to help our customers feel more comfortable in their homes and vehicles. Armed with a staff of some of the most talented installers in the country, Accu Tint Inc. is ready for your call. Whether it's your home, your car or your business, trust your costly investment to only the best! We stand behind our work and strive to make each customer 100% happy. Our mission is to help our customers feel more comfortable in their homes and vehicles with window tinting services they love. You know what else? We love what we do. And we’re humbled that you love us too. With Accu Tint Nashville, you can rest assured that you’re going to get nothing but the top of the line, latest technologies in premium window tint film, applied by our talented crew. Our exclusive agreement with Autobahn Elite and others gives you access to superior window tinting products not available anywhere else in Middle Tennessee. It’s hard to say exactly what it is that makes Accu Tint so special. 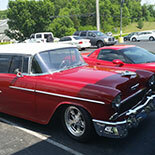 It’s true, we have the best window tint installation technicians in Nashville. But our customers have to get at least some of the credit. Sharing our strong values for excellent performance, efficiency, and craftsmanship, they come to us from all over Tennessee, Kentucky, Indiana, and other neighboring states. And they keep coming back. 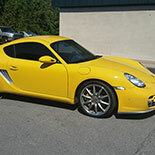 Whether for home or office, sports car or “soccer mom” SUV, Accu Tint Nashville has the right tint for you. 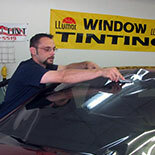 We carry a wide range of tint films, from economy protection to top-of-the-line performance. Bringing you the very best window film products on the market today, like Llumar®, 3M Scotchgard® window films and ClearShield®, we are proud to be the only official installer in the Southeast to offer Huper Optik® Automotive and Autobahn Elite. Get Started Today!Call us today to schedule an appointment! We have developed our reputation one customer at a time, and we would like for you to be next. Our Nashville auto window tinting is next to none — Call today to schedule an appointment or click here to e-mail your request.